Videos showing people stammering are being classified as comedy on YouTube. It's typical of people's attitude towards the disability, say those with the condition. "You can see them thinking 'arsey little bugger, I was only having a laugh'. You're the comedy show and if you don't play along you're the one without a sense of humour, the one ruining everyone else's fun." It's an everyday scenario for someone with a stammer and nearly 750,000 people in the UK have one, according to campaigners. While many disabilities elicit only compassion, stammerers seem to be viewed by some as fair game. After all, what's the problem? It's only a stammer. "It's not 'only' a stammer if you have one," says Leys Geddes, director of the British Stammering Association (BSA). "Simple things, like ordering a sandwich at lunchtime, are a complete nightmare. They take an immense amount of energy and thought. For some, stammering simply becomes unbearable." The YouTube situation is indicative of people's attitude in general, says the BSA. Videos showing people struggling to speak have been categorised as "comedy" by those who've posted them. But the controversy has at least put stammering in the headlines for the first time since Gareth Gates stuttered through his Pop Idol audition on prime-time television. Keen to seize the opportunity to educate people, Mr Geddes has now posted his own video on the website, arguing for greater understanding for those who stammer. He calls it "guerrilla marketing". See the link on the right to view it. "Usually stammering is not talked about, it's not a media-friendly thing and is viewed as untidy and awkward. It certainly isn't a trendy issue. And who wants to interview someone with a stammer? You just don't know how easy it will be or how long it will go on for." The very nature of the disability makes it hard for people with stammers to get their point across when they are given the chance - quite literally. "That's the conundrum," says Mr Geddes. "We need to educate people about stammering but those who have one don't want to talk publicly because it's so daunting. If you find ordering a sandwich excruciating, imagine how you'd feel going on live radio or television." But disability campaigners think the media owes people with stammers the opportunity to get their voice heard. They say it plays a large part in shaping society's dismissive attitude towards the disability. "A stammer is used as television shorthand for someone who is socially inept, indecisive, emotionally unstable - even a killer, says Damon Rose, editor of BBC disability website Ouch! "They use the disability to externalise people's inner problems." This sort of portrayal - for example, Ronnie Barker's character Arkwright in Open All Hours - can trivialise the disability and even make people think someone with a stammer has mental issues, says the BSA. No wonder some people think poking fun at stammering is ok - and a lot of people do, say those with the disability. But tackling them over their attitude is not easy. "When you stammer it's as if you are incapable of thought, you're just locked in time trying to get that word out," says Claire Pirnie, 25, herself a stammerer. "If someone makes a dig at me I usually wait until I'm calmer and then go back and tackle them over it. Many people don't even realise it is a disability and are apologetic. "What really upsets me is people dismissing it as a superficial thing, something that can easily be dealt with. It's just not that easy. The reality is stammering is on my mind every minute of every day, I adapt my behaviour all the time and avoid situations. People with stammers refer to it as being a walking-talking, self-editing machine." It's a misconception many people have, that with a bit of effort people can "cure" their stammer. Paradoxically, Gareth Gates didn't help this misguided view, says Mr Geddes. While his stammer made headlines, his struggle to deal with, and largely conquer, it - played out weekly on national television - came across as swift and relatively easy. It's not. Scientists still don't know what causes stammering, let alone the "cure". Around 80% of children who develop a stammer recover spontaneously. For those who don't, research suggests treatment programmes at an early age can help. 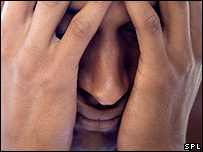 If the stammer continues into adulthood, techniques for controlling it can be taught. How well they work depends on the person. 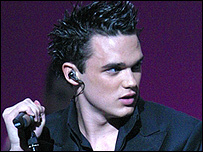 Gareth Gates uses the McGuire technique, which focuses on mastering the fundamentals of speaking - breathing. He is now a qualified coach himself. Dominic Barker was told at an interview that if he "cured" his stammer he might stand a chance of getting the job. The 26-year-old killed himself in 1994 because, even though he held two degrees, he couldn't get work due to his disability. "You can no more cure a stammer than you can left-handedness," says his father Alan. "People often have a dismissive and mocking attitude. They just don't realise the harm they are doing, that a comment they think is a bit of a giggle is acutely personal to the person with the stammer." But it's not sympathy that people with a stammer want, it's understanding. "I'm lucky, throughout my life I have always wanted to talk despite my stammer," says Mr Geddes. "But it destroys too many people too early, then they just remove themselves from life - or worse." I've stammered since I could first talk. As a toddler my father tried shouting at me every time I stammered to discourage me and then encouraged my siblings to tease me out of it which made it far worse. I avoided speaking in junior school but got a scholarship to a selective senior school. Once there, the annual elocution competition was compulsory. At 11 years old I couldn't cope, became hysterical and tried to harm myself. The school had the sense to back off and I was excused all vocal work. There was no "treatment" available so they were as lost as I was. My parents found me embarrassing and refused to talk about it. My dad tried to force me to leave school before O'levels because he believed no-one would ever employ me and he'd found a factory job for me. I refused and got 10 o'levels. Then I wrote to my form teacher asking him for help and between us, we worked out how to make it easier, breathing and tricks in my head to get the muscles to relax. It isn't easy or quick and I'm still working on it 20 years later. Three A'levels and two degrees later, I'm head of marketing for a £100m company. I've presented to 125 people although this still leaves me exhausted. I usually sleep immediately after a presentation or a job interview which can have it's funny side, The whole area badly needs support. I know four or five other people who are far worse than me and the damage that the general ignorance causes is heartbreaking. Primary and secondary school was literally "hell" for me .The ridicule and comments were so hurtfull and demoralising.These ignorant creatures have no conception of the damage they inflict and as regards Youtube well-- I just wonder if the creators of this site would personally enjoy being the subject of such abuse. Hey world, we don't care whether u make fun of stammers. I am a stammer and I am proud to say that. I have proved to my previous company "What matters is talent and just not the way u talk". They understood this and made me team leader for a project. All those who are planning to make fun of us,have the gutts to challenge us in this ever-challenging world. I am sure that you are bound to fail. I thought working in IT would provide the escape for me as a stammer but found myself humiliated with collegues because they either thought I was not eloquent or stupid when you can not fire back right away whenever I had to say something and I stuttered or during presentations. Speech therapies help but sometimes not getting your words out of your mouth can be like being stabbed with a dagger when the other person or receiver turns away misconstruing what mean t say without being patient with you. It can be very frustrating. A good article. As a stammerer of 40 plus years I speak from experience when I say that I would miss it if I didn't have it . It is as part of me as my nose. Stammering is what you do in an effort not to do it. So try and forget about it. I found out that accepting everything about yourself is the way forward and it does get better. Some times its not too bad and rarely is it terrible. If it is I forgive myself for making an 'idiot' of myself and get on with it. Most people dont even notice - they are more concerned with their own lives rather than what you are doing. I never stop talking - or trying to -so never give up! I'm 32 and I've stammered since I was about 8 or 9 years old. What other people cannot appreciate about the condition is how much energy I have to devote towards speaking. When I consider any situation, and I mean ANY situation, no matter how trivial, the first unconscious thought turns to how I am going to speak. Can you imagine how that feels? I would ask people to consider just how often they enter speaking situations. (and let me tell you, it's a LOT). And then consider how stammerers have to cope with this minute after minute, day after day. Claire Pirnie says what most cannot ever understand - "stammering is on my mind every minute of every day". You never fully escape. Simply answering a telephone can become a nightmare. I still remember 50 years ago being sent out to buy sausages and returning with something else purely because I couldn't say the word. Woe betide anyone in my presence who mocks or tries to imitate a stammerer. It's rather like grief - it never goes away, you simply learn to manage it as best you can. But it's always there, like an enemy in the soul. i have a stammer. im a 19 year old student and i have had this stammer since i was a child. i never really knew what it was or why i had it. frustrating doesnt begin to explain how it feels to have something on your mind but you know you cant say it, for fear of being mocked or not understood. it sounds trivial but i can sing with a clear voice, and that is the voice i hear in my head. yet when i talk in class or to my friends its a constant struggle to force out the words. i often desire isolation as my stammer prevents my from forming any sort of immediate friendship. i make a terrilbe first impression. however, until i feel as if i have fooled the world into think that i dont have a stammer, i will always be plauged with this soul destroying fear. yet my stammer has driven me to write what i think rather then say. i have written countless stories, poems and other creative pieces. whats more hurtful is that i have never came across anyone else with a stammer. I am 34 years old and have a stammer ever since the age of 3. I did have speach thearpy until the age of 5, which did improve my stammer. My stammer gets worse when I am nervous and sometimes I just can't speak at all. I have developed my own techniques to get around the problem, like all stammers we are quick thinkers and subsitute different words mid-sentence to get around the problem. I am a doctor of Chemistry and am a director at the company I am employed by. Going on job interviews is always a challenge, I always get 'you are not what we are looking for' even though I have over 10 years experience in my field. Once I even read the comments of the interviewer when he answered the call of nature, it said 'has all the experience we are looking for, but no chance with that stammer'. I agree that other people often make light of the situation but often they are trying to be helpful. I am a Finance Director and sometimes it infuriates me that a point that I am trying to put accross can be devalued if I stop in the middle of a sentance. However, people who know me learn that my opinion is still valuable. It is the ignorant people who judge quickly that cause me the problem. I have held directorships of a number of companies for nearly 20 years despite the predjudices created by by stammer. I had a stammer when I was younger, thankfully through speach therapy I managed to overcome it (allthough it does come back when I'm very tired or stressed) but it left me with a very slow speach pattern. This has ment that when most people meet me they think I'm very simple and possibly retarded and it can be quite a shock if they actually listen to what I say, several times they've turned around and said "Oh! You are intelligent." It still led me to be bullied mercylessly at school with the result that I'm a very withdrawn person now and hardly speak to people I dont know. I have stammered since I was 4 years of age and I am now 45 and still occasionally stammer. Stammering did seriously affect my confidence as a teenager but it has never stopped me achieving my goals in life. However, I am still scarred by the continuous taunts as a teenager and it always amazed me that complete strangers - even responsible people thought it OK to mimic you. I just learnt to rise above it. It did have it's advantages as well though: girls used to think it cute, and you can also use it as a delaying tactic when you are in a bit of a situation. I have almost removed my stammer by relaxing when speaking and by lowering my voice by half an octave, but I relapse for short period every now and then. I used to stammer really badly and was turned down for many jobs at interview. Consequently I got to be very good at interviews. After a successful career in teaching of all things I now punish those organisations who turned me down by phoning them in winter from hot desinations like Florida or Southern California and ask them what the weather is doing. They always say it is cold and raining so I reply that where I am it is hot and sunny and I am sat by the pool drinking a gin an tonic. It is time stammerers gained revenge on those who will not employ us.